Protecting Input: Implementing Whitelists in PHP – Interstell, Inc. In my last post, I talked about implementing whitelists in Java. We finally got to see some actual code! Not actual cannibal SHIA LABEOUF level stuff, but kinda cool nonetheless. As promised, in this post, I’ll show you how to implement the same whitelist with the same philosophical underpinnings in PHP. Why do we care about whitelisting again? Yeah, we all know sanitizing input’s a good idea. It’s become a mantra. But let’s say we want to save time and skip it. What could possibly go wrong? Let’s say you have a database application, and let’s say you’re feeling pretty good because you’ve implemented something called parameterized queries on the database. Why? Because you know that parameterized queries protect your application against SQL Injection (we’ll talk about that in a future post). Yea you! Your database has an important layer of protection! Your database application lets users contribute episode guides for science fiction series. Other users can search for information about the series, and you’ve built a nice little community. You’re starting to generate ad revenue! Then, one day, Joe Evil logs into your site. This is a little bit of code that will display a pop-up with the message, “Hi there!” That’s harmless, right? Don’t let Joe Evil destroy your reputation. 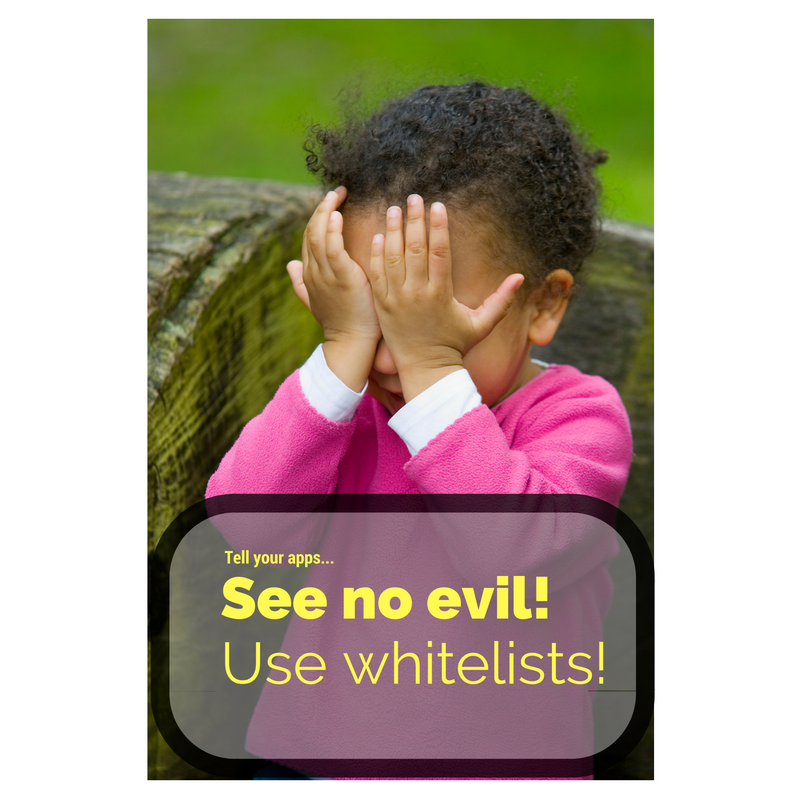 Implement whitelists to protect yourself! That would put serious downward pressure on your community’s trust! And your ad revenue. Are there other ways to protect yourself? Sure! We could carefully consider the target output environment and encode our output appropriately. We can use other tools to go beyond whitelisting to intelligently accept some HTML statements and reject others. We’ll talk about these options in more detail later. But security is best in layers, and the first layer can be something like a whitelist. Why do you implement a whitelist? To help build your customer’s acceptance and trust. To make sure only the kind of data you approve of gets into your application. To delight your customers and attract new customers. It’s easy to lose a customer over an incident like this. It’s a lot easier to prevent these incidents so your customers don’t leave. Make sure your application sees no evil. Use whitelists! The considerations for implementing a whitelist in PHP, like the kinds of suitable applications and the whitelist’s anatomy are the same as they were for the Java application. The implementation’s a bit different, though. The application’s called input-01-php, and the form in question is named index. This code snipped builds an array of arrays. The outermost array makes up all of the rules for index form. Each individual array (there are three in this example) contains a field definition. For example, transfer_description field can be up to 20 characters long and can contain Latin alphabet characters plus a space. The array containing the $_POST variable is named $arrPost. The foreach statement means we’ll reach each field as we come to it. The field name will be contained in $key and its value will be in $value. If the count is 1, it means the field doesn’t exist, and we return false, which means the field doesn’t exist in the whitelist. The code makes sure the value’s not too long. If it’s not too long and there’s a minimum length specified, the code checks to be sure the value is long enough. Finally, the code loops through the value, one character at a time, and makes sure that each character is in the whitelist. Only if the value meets all of those conditions will the function return a true, meaning the value’s okay to process. Otherwise? Too bad, Joe Evil. Today is not your day! I’d like you to notice something: At no point do I echo the actual value to the error log. Some attacks target the error logging subsystem, so keeping possible injection attacks away from the log is important. I’m not aware of any such attacks in the wild right now, but a) there may be attacks out and about that I know nothing of and b) malice tech advances at the same rate (and sometimes faster) than the general tech world, so who knows what tomorrow will bring? At this point, whether you’re a Java or a PHP developer, your arsenal includes a slightly eccentric whitelist program. Is it perfect? Good gravy, no! But under some circumstances, it can give you a lot of protection. In other circumstances, it can become one component in a more sophisticated defense. And sophisticated defenses are both cool and fun! In the next post, I’ll discuss what such a defense might look like.